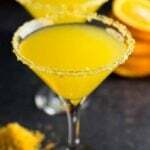 A wonderful orange martini made with a combination of vodka and orange flavors. Mound coarse sugar and orange zest on a small plate. Mix with your two fingers, gently pressing on it so that the sugar absorbs the color and flavor of the zest. Rub around the rim of the martini glass with a lemon or orange wedge to moisten it. And roll the rim of the glass on the zesty sugar. Set aside. Put all ingredients except sugar and orange zest into a cocktail shaker with ice. Shake until the mixture is icy cold, about 15-20 seconds. Strain into chilled martini glasses and serve immediately. * You can easily prepare simple syrup at home.In a medium saucepan, combine 1/2 cup sugar (or 1 cup if you like it sweeter) and 1 cup water. Bring to a boil. Let the sugar dissolve. Remove from heat and cool. It’s ready to use in cocktails now.